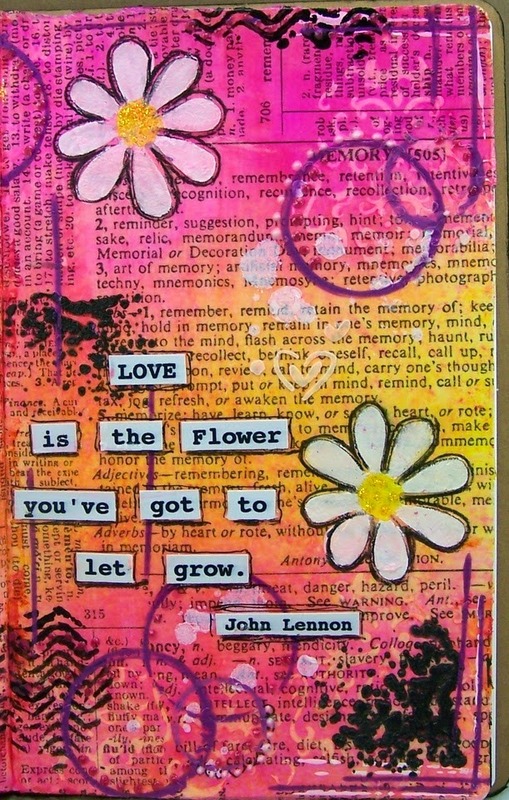 Eclectic Paperie: Love is the Flower You've got to let Grow! 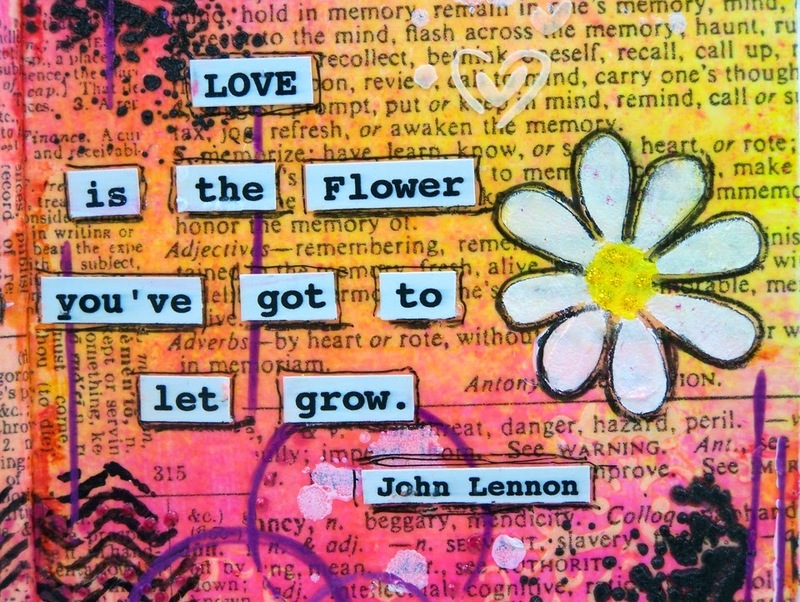 Love is the Flower You've got to let Grow! 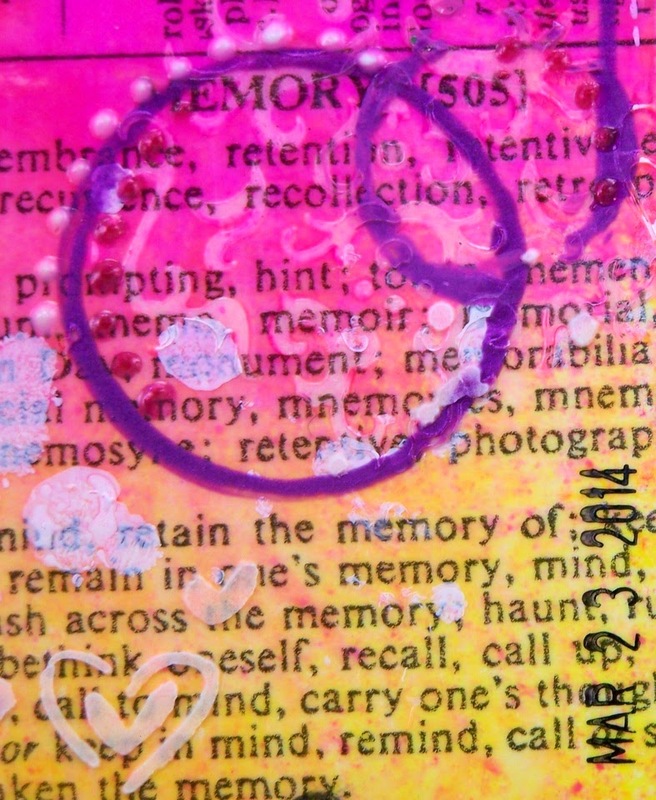 I used bright Dylusions Ink Sprays for my BG colors on top of Tim Holtz Terminology tissue wrap and left the words showing though. Then I let the FUN begin! 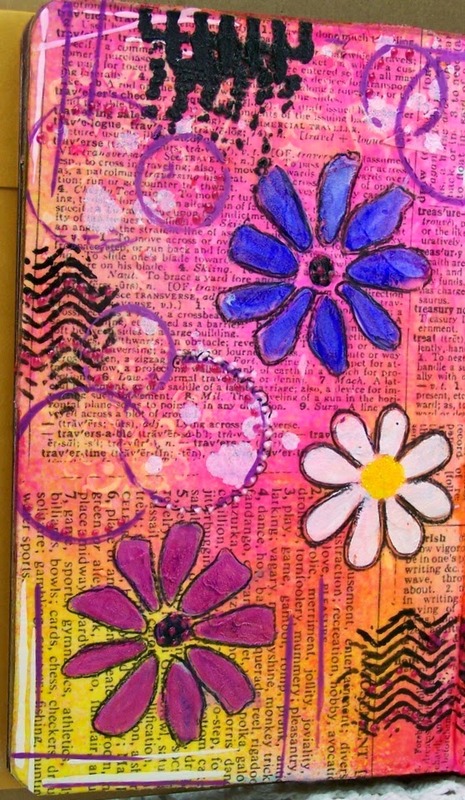 The flowers were added using Wendy Vecchi white embossing paste with my Wendy Vecchi 3 Fresh Flowers Stencil. The black stencil marks were made using Wendy Vecchi's black embossing paste and the TCW Mini Textured Stencil. I painted the flowers with Silks Acryllic Glaze in Boysenberry and Raspberry wine. Same process except some additional steps. The daisies were painted with titanium white Golden Paint. I outlined the daisies with a Stabilo all pencil in black. Circles were made with the Raspberry Wine Silks Acrylic Glaze using two tops from bottles. 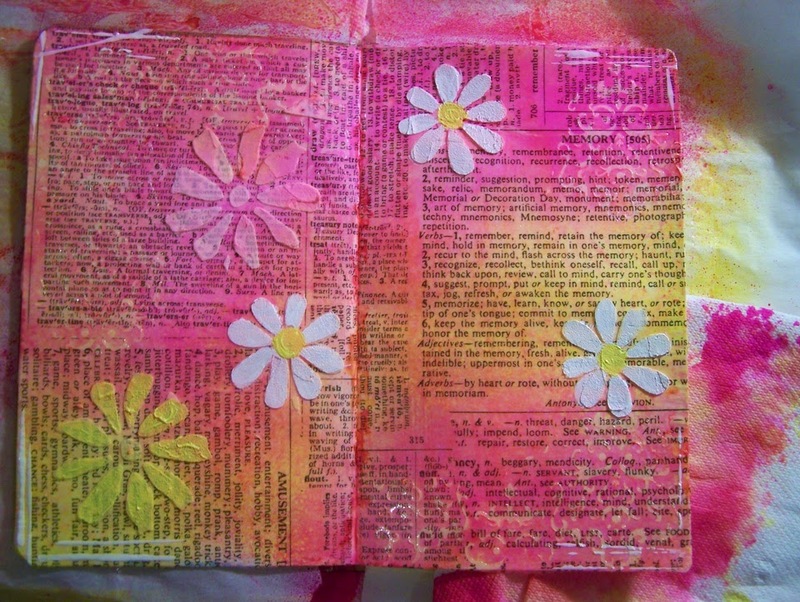 Then I added dots in Blizzard and Peony using Art Anthology Dimensional Crystals. Also if you look closely you will see the white heart I added with the TCW Confetti Stencil. I LOVE this stencil so much I use it on practically Everything! In this close up you can see the FAB texture on the flower outlined with the black pencil and the dimensional dots in the center. I added this date stamp. This helps me keep a record of when I made something so I can follow my artistic development as I try new things. Silly maybe, but I like it! Tissue wrap with embossing paste flowers. Can you see them? Here I started painting the flowers (after the paste and ink were completely dry). So pretty Sue! Very happy. & colorful. You brightened my day with this one! Adorable colors!! 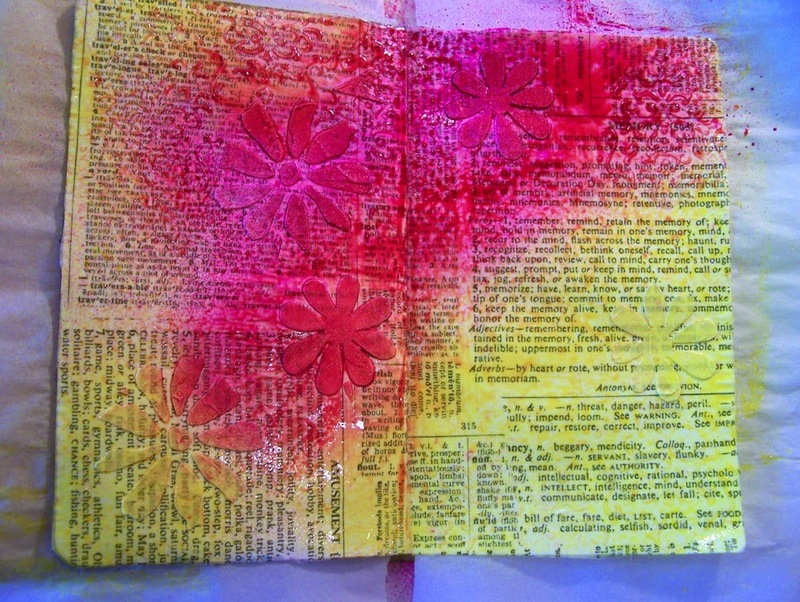 I love the embossing paste flowers, I need to use my paste more often!! 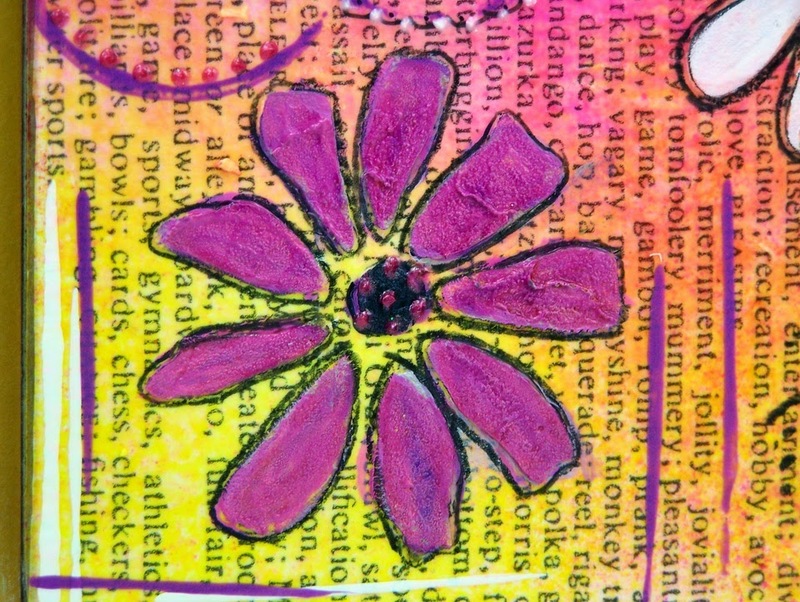 And I never thought to paint on embossing paste with the silks - I need to use those more often too!! 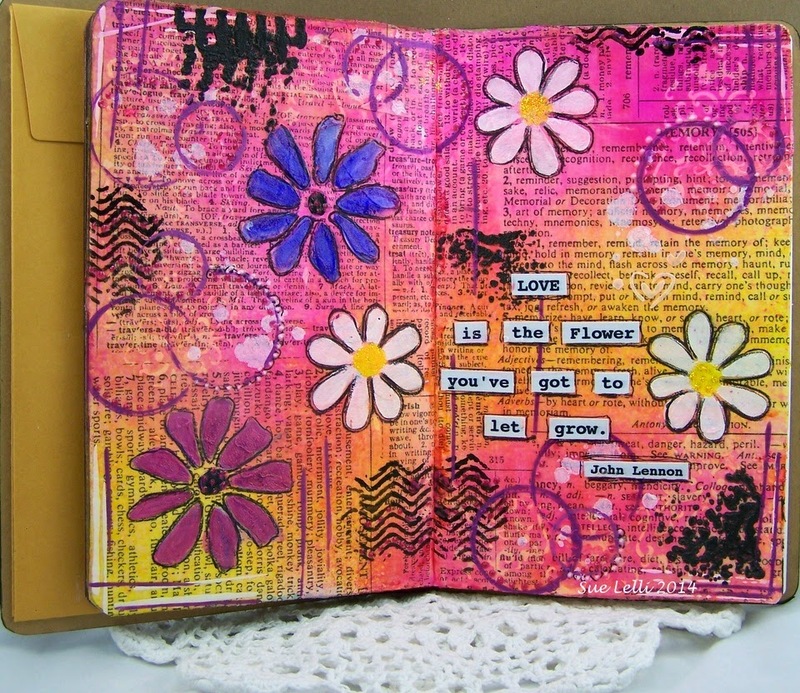 Sue thank you for sharing your lovely happy pages. I really love what you made. It makes such a good impression creating textures like you did. Also love your vivid colors. All in all very inspirational seeing your art !! So happy you shared !! Zesty and so full of fun Sue . . .gorgeous!!! I love these colors. Great job! A Little Spring in Your Step! 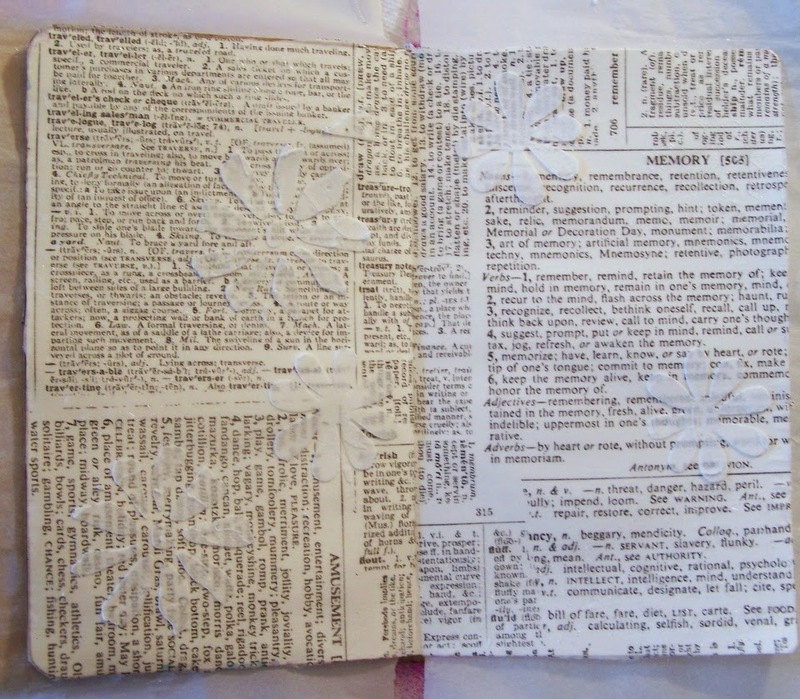 ePlay Challenge - Alter a Book!